We packed for Barcelona without expecting to lay our eyes on a next-gen Sony Xperia Z4 flagship, and yet that's exactly what happened. 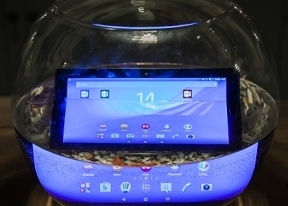 Only it was the Xperia Z4 Tablet, and not the smartphone. No compromises have been made in terms of hardware and the slate is impressive in every respect. You get a 10.1-inch display of WQXGA resolution (2,560 x 1,600 pixels makes a lot more sense) for a sharp 300ppi density. We had a minor gripe with the previous-gen tablet and its only average 224ppi and we're happy this has been addressed. It's an IPS panel too, and features Sony's proprietary TRILUMINOUS and X-Reality technologies. In practice this results in pleasant colors, good brightness and wide viewing angles. While the screen remains legible, a significant drop of brightness is observed at extreme angles, though. The whole thing quickly turns into a smudgy mess, but the engineers pointed out it's not the final version of the oleophobic coating and it will get a lot better by the time the tablet hits the stores. 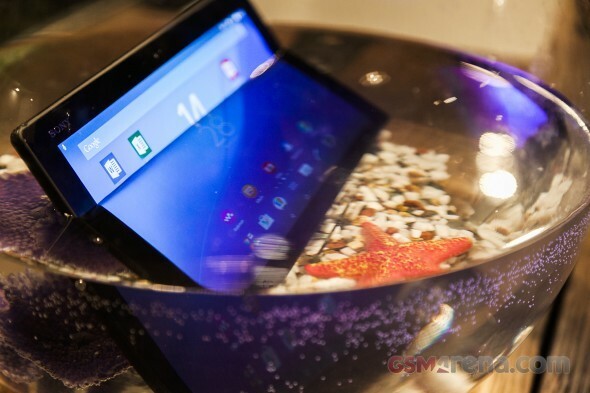 The Xperia Z4 Tablet actually works pretty well when wet - we had the opportunity to test it out and it's miles better than any other touchscreen in that regard. Design is your typical Xperia affair, or as Sony likes to call it, OmniBalance. Not much has changed since the previous generation, with the notable exception of the 3.5mm jack, which has been relocated to the top. Engineers managed to trim down the body marginally, compared to the predecessor and now the tablet measures 254 x 166 x 6.1mm. Sony is keen to point out that the Xperia Z4 Tablet is the lightest 10-inch tablet at 392g/396g for the Wi-Fi/LTE versions respectively. It packs the same 6000mAh battery as the Xperia Z2 Tablet, and sports an IP65/IP68 certification, as you surely couldn't have missed in the title photo. Inside, the Xperia Z4 tablet continues to deliver. The almighty Snapdragon 810 is joined by 3GB of RAM for smooth multitasking, and if the 32GB of built-in storage isn't enough, you can always pop in a microSD card. Beyond the basics, the Xperia Z4 Tablet isn't short on goodies. An 8.1MP Exmor RS main camera will help you raise eyebrows if used in public, while the 5.1MP wide angle front snapper should be instrumental in video calling. The slate also packs stereo speakers with a handful of quality-enhancing technologies. 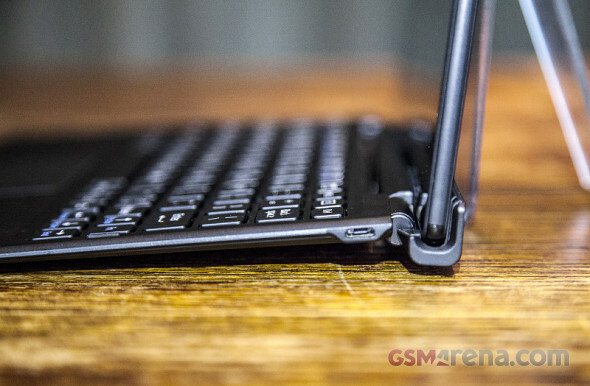 Alongside the Xperia Z4 Tablet, Sony announced a dedicated keyboard dock for power users. The BKB50 connects via Bluetooth and transforms the Zperia Z4 into a full-fledged ultrabook. It offers 0-130Â° tilt angles, keys are comfortably pitched and a touchpad is present, in case you forget that you can simply tap on the screen. The video below offers a quick glimpse of Sony's lightly-skinned Android interface as well as the keyboard dock in action.